Inside the stores of every wireless carrier, there is always this special, well-lit section reserved for the priciest, most sought-after smartphones. Unfortunately, we sometimes get so carried away playing with such top-shelf handsets that we overlook the numerous cheaper alternatives. That is why today, the PhoneArena Awards of 2011 will honor the best budget-friendly smartphone of the year. And for a handset to deserve the prestigious title, being reasonably priced is not going to suffice. We are looking for a smartphone boasting a great value-for-money ratio combined with a price tag that even cheapskates would call cheap. Another thing that we have to mention is that we are taking only the carrier's launch price into consideration, so third-party retailers, such as Amazon or eBay, do not count. That being said, it is time to unveil the best budget-friendly smartphone of 2011, but before we start, allow us to remind you that eight other awards have already been given. Below is the list of the categories we have announced so far, so in case if you have missed any of them, feel free to take a look. What makes the LG Thrill 4G different from other smartphones is that it is blessed with the skill of 3D. Besides capturing 3D content with its dual, 5-megapixel cameras, it lets you watch it straight on its display without the need for you to wear those dorky glasses. And knowing that the smartphone packs some more than decent hardware, namely a 4.3-inch WVGA touchscreen and a 1GHz dual-core processor, it is hard to believe that it launched bearing a rather modest, $100 price tag. That is pretty good for a smartphone that will surely impress your buddies when you show them some 3D photos of your pet iguana. “The world's most powerful smartphone” is the catchphrase the Motorola ATRIX 4G was marketed with back in the days. Well, its successor, the Motorola ATRIX 2 may not have what it takes to be worthy of such a title, but with a $100 on-contract price, it is still one pretty sweet smartphone. For a benjamin, you get yourself a device with a 1GHz dual-core processor, 4.3-inch qHD display, and a 8-megapixel camera that can shoot 1080p video, which are all specs similar to what some twice as expensive smartphones can offer. The Samsung Focus Flash well deserves its spot in today's category as it offers quite a lot of bang for its buck. Sure, its hardware may be considered nothing out of the ordinary for today's standards – a single-core 1.4GHz processor, 3.7-inch WVGA display, and a 5-megapixel camera, but when you take into account its on-contract price of $50, there is not much more that you can ask for. Well, folks, the year's best budget-friendly smartphone is the LG Thrill 4G, followed by the Motorola ATRIX 2 and the Samsung Focus Flash. 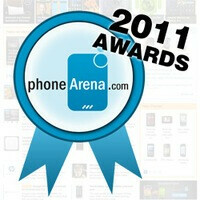 However, the PhoneArena Awards of 2011 are not over yet. The next category will be announced tomorrow, so stay tuned! All of them sold by AT&T... what might that tell us? actually, on that note, NONE of these phones should qualify. If your looking for a "budget minded" device, you cant take in not only the up front price of the phone ,but the price of the contract. With that, anything from ATT and VZW is automatically disqualified. With unlimited everything from Tmobile at only $60 a month compared to 140 from ATT (and you still get overage charges), you could buy the most expencive phone on Tmobile and still be more "budget friendly" than a free smartphone on ATT. The best deals would be the LG G2X at 100 down payment, and 75 a month with unl service and phone payment included. For sprint, if you can pick up the SGS2 for one of those 0.1c sales, that would be an awesome deal. But it doesnt really matter. ANY phone bought on Tmo or Sprint no matter what the upfront cost is more budget friendly than ANY deal you can get on ATT/ VZW. Sorry, but I think you guys totally missed the "budget consious" consumer mentality. @remixfa, I understand your point, but if you start down that path, then where do you stop? For instance, it's even cheaper if you join a family plan with 3-4 trustworthy buddies. And cheaper still if one of those buddies gets a corporate discount. Case in point, I'm on a family plan through AT&T with a discount. It will be ~$50/mo for voice/data/text for my friend on the plan to get one of the phones mentioned (I'm recommending the Atrix 2 to him) than to join a singles plan on T-Mobile or Sprint for $90 per month. As far as the $0.01 sales go, those are only if you are adding a line or joining new service, not for transferring service from single to family plan on the same carrier. TT, now your overcomplicating it. Besides, even if you go the family plan route, Tmobile and Sprint are still cheaper on family plans. 2 Unl everything lines on Tmo is only $100. Add 3/4/5 line for 30 a piece for unl everything. Tmobile and sprint both offer corporate discounts. so it doesnt matter which way you slice it, tmo and sprint will aways be the value leaders of the big 4 carriers. Yeah . Maybe you didn't read the article . Only the title , before you spewed . They said "budget-friendly smartphone" . Not smartphone , plus plan , plus unlimited whatever , you want to chime in . . . It's obvious because you started making up all these words , budget minded , budget conscious that weren't even in the review . It was you that totally missed . . .
holy cow, is this Gallito in another account? no one else could possibly talk like that. trade a few ... for , here and there ,and its gallito speak. lol BTW, Digi, if your a "budget minded" person, you look at the total picture, not just the upfront cost of the phone. unl everything on tmobile = 60 a month x 24 months = 1440 for the contract unl on ATT = 140 a month x 24 months = 3360 3360-1440 = $1920 PER LINE savings over ATT. You can buy 2 unlocked iphone4s's and still save money over ATT. There isnt a single "budget friendly" person that would miss that simple fact. Someone smarter than me needs to help. On T-Mobile's site, it looks like "Classic Unlimited-Talk+Text" is $60/mo, and then you need a data plan, which would be an extra $20 to have high speeds up to 2GB. So, it looks like $80 minimum without tax and fees. That's still a great deal, but it's 25% more than you calculated. My ~$50/mo price point above was per person, on a family plan, after tax and fees, after discount applied (but only 2GB data) on AT&T. FYI - agreed you can get discounts on T-Mo and Sprint, but some companies offer more of a discount through AT&T (our case). you need to look at the value plans, not the classic plans. they are much cheaper. the difference is the classic is.. well.. the regular 2 year contract where they give you the cheaper phone. The value is much cheaper per month, but its full retail for the phone... but u can pay it off over time. You pay a down payment up front (which is cheaper than the classic plan pricing anyways), and the rest gets on the bill. the difference between the value plan and classic is 480 per line savings by being on the value plan. you have to look at the total cost of ownership (yes, it seems more complicated than it is, i have to explain this to customers EVERY day.. lol) unl value plan = $60 a month = 1440 for 2 years. uln classic plan = 80 a month = 1920 for 2 years ATT unl plan = $140 a month = 3360 for 2 years. For arguement's sake, everyone gets an SGS2 hercules/skyrocket!! **Value plan is full retail for the device (amortized over 20 months same as cash) You pay 230 downpayment, and the rest gets added to the bill at $15 a month until its paid off. Even with the most expensive phone included on the payment, your talking 75 month (60+15) vs 80 a month for the classic plan.. its still cheaper. 1440 + 550 = $1990 true cost of ownership for 2 years **Classic plan is regular contract price for device 1920 + 280(before rebate) = $2200 true cost of ownership **ATT unl 3360 + 300 (before rebate) = $3660 so 1990, 2200, or 3660... which one do u think the "value mind" is going to hit? And remember, this is for the same "top of the line" device.. And if you dont get the most expensive phone on Tmobile, the savings are even greater. If you get the G2X on tmobile is only 400 instead of 550 full cost, so it would be $1840 instead of $1990... but that's still way cheaper than the $3510 you would be paying for the LG Thrill in true cost. @remixfa, I now officially can't ever believe anything you say because you are now advocating the SGS2 hercules/skyrocket after you have commented multiple times that these are "not true SGS2's." :-P Seriously though, that is interesting, I didn't know that about T-mo's pricing structure. It does truly sound like a cheaper alternative. I think the main reason people don't go to T-mo is because they don't have any of the latest super phones on Android and iOS. Sure you can get an unlocked iPhone 4S to work on T-mo, but who wants to be stuck at EDGE network speeds? I appreciate all the comments remixfa, you're one of the few Phone Arena commenters I can count on to have a good debate with (without it becoming too flame-warrish)!! i knew someone would throw the skyrocket thing at me... lol. i chose a phone both carriers had.. most expensive phone (and one of the only) to chose from. As far as android phones go, Tmobile has the over all best line up and most choices. Yea, it doesnt have an iphone choice (or a REAL SGS2 :) ), but who cares. Its so common to unlock it and have it on Tmo anyways, we have an iphone support team.. lol. FYI... AT&T doesn't charge $300 for ANY phone, EVER! That's Verizon. The highest they charge is $249, and I got my white Skyrocket for $149. AT&T costs are 39.99 voice, 20.00 unl msg and free cell to any cell calling and data 15/25 200MB/2GB data- 75/85 max pre-tax. No, 140.00...2 lines would be 59.99 550, 30.00 unl msg and free cell to any cell calling and data 15/25 per line - 120-140 max. @networkdood Right, but remixfa was talking about unlimited plans. AT&T -> unlimited mins ($70) + text ($20) + 4GB data ($45) = $135 I agree that your layout is more practical because who really needs all those minutes for calling land lines, and actually your last calculation is wrong. To get free cell to any carrier cell, you need at minimum the family plan 700 minutes ($70), plus it's $10 for an additional line. So it comes to $140-$160 (200MB-2GB) for that family plan. I think you actually missed the mark with what this award is for. It's for the PHONE, not the contract behind it. It has nothing to do with the service, the carrier, or day of the week. It's not a marketing ploy to show budget-conscious consumers where to shop. We all know TMo has the cheapest plans (along with the worst coverage) and Verizon has the most expensive plans (with best coverage). I think the HTC Vivid should be in that list. It's a 4G LTE, HSPA+ phone with qHD display, 1.2ghz dual-core phone for only $99 in select areas (states that have LTE service). Didn't we saw that one already? SGS2? even tho I am a die hard android fan after owning both devices I am surprised that the 3GS isn't on there. and remixfa you do make perfect sense about the budget carriers but i don't think they included that in their process. 3GS did not come out in 2011.